Jordi from Barcelona emailed me about his new pedagogic workshop called Floating exhibition, an activity thought for children and their parents. Looks like fun. Would love to partake with our little Ella. What goes up must come down! Balloons return to the land and sea where they can be mistaken for prey and eaten by animals. Balloons are hazards when they enter the aquatic environment because they can look a great deal like jellyfish—a major source of food for many animals. Sea turtles, dolphins, whales, fish, and seabirds have been reported with balloons in their stomachs. It is believed that they mistake balloons for jellyfish which are their natural prey. In 1985, an infant sperm whale was found dead of starvation as a result of ingestion of an inflated Mylar balloon which had lodged in its intestines. 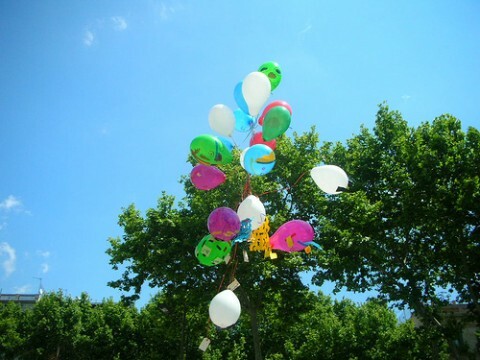 Ribbons and strings tied to balloons can lead to entanglement.